Originally from Columbia, SC, Dr. Parker moved to North Carolina to attend Duke University for her undergraduate studies. There she received her Bachelors of Science degree in Biology with a concentration in Marine Biology. Afterwards, she attended the University of Georgia College of Veterinary Medicine. Dr. Parker first practiced small animal medicine in Statesville, NC and continued to practice in Houston, TX. In 2008, she and her family moved back to North Carolina where she has continued to work ever since. 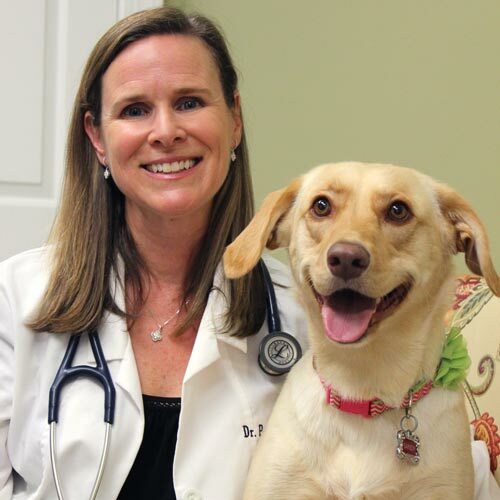 Dr. Parker’s veterinary interests include soft tissue surgery, internal medicine, and pain management. Outside of veterinary medicine, Dr. Parker enjoys gardening, decorating, outdoor activities, and spending time with her family and friends. She lives in Apex with her husband, Eric, her 2 daughters, Caroline and Lauren, and her 2 dogs, Georgia and Sandy.